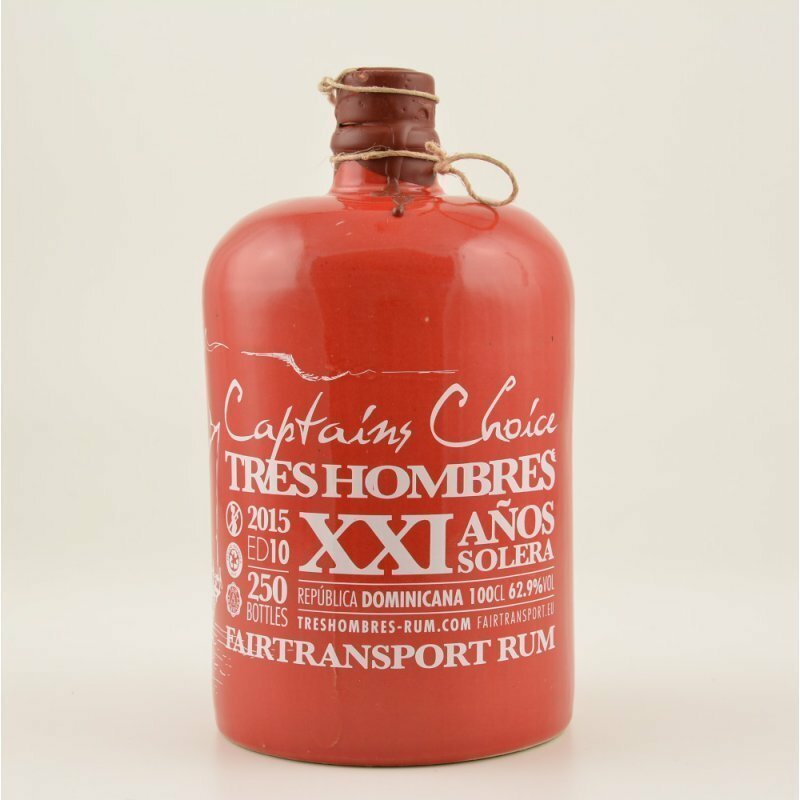 Have you found an online vendor selling Tres Hombres Captain's Choice 2015 21-Year? The noze is strong on the alcohol with vanilla and there are also some very sweet notes of fruit. Need long oxygenation.Taste: Oak, caramel, chocolate and cacao. Very long aftertaste. Solera method, 21 Years. Wow, huge flavour and strong, punches you in the face then you want more. Sweet fruit carries through, finish lingers. Yes it is very expensive, but that's IF you find it! I tasted this at a rum tasting event. Only 250 made it's extremely rare and the price is actually fair compared to other brands of less impressive rums for an equal price. Very well balanced, rich in nose and in flavor. 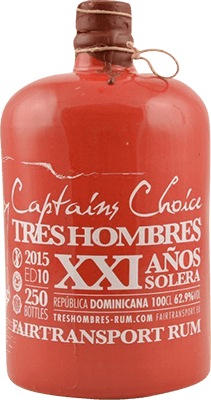 Sweeter and smokier than most other Tres Hombres, closer to what Oliver y Oliver's rums taste like, with a lot of butterscotch as well as dried fruits. Comes in a beautiful vintage red jar which with a little dust on feels very authentic... This straight in a tulip tumbler is my Friday-night-in-my-favorite-chair choice! If I could afford it. And if I could find it. There are a lot of reasons I didn't expect to like this. The price was very high due to the limited production (only 250 bottles); it had a high abv of 62.9%; and I hate the bottle, as the wax was difficult to remove, you can't see through it to see how much you have left, and it doesn't pour well into a shot glass without spilling a few drops. Still, the smell and taste were excellent. Has a very nice sweetness with sugarcane, caramel, spice, and a touch of oak. Hot at 62.9%abv, but surprisingly tasty, and the high abv can obviously be cooled down with a little cold water if you prefer. Not my all time favorite, but VERY good. Beautifull golden colour and more gentle in the nose than last year. A lot more typical dominican. Burnt sugar, karamel and something spicy like liqurish. In the mouth its a massive explosion of inputs. Dried spices, toffee and molasses that gives it a bit of sweetness in the end. A slight afterburn on the tongue, logical with those percentages. But also a good long semi-dry aftertaste that really brings forward the oak and molasses. History in theese productions means alot, but the Captains Choices are really extraordinary bottles. I cannot compare this to much else rum. Captain has still got me hooked!